France will seek Arab support on Thursday for a humanitarian corridor in Syria, the first time a major power has swung behind international intervention in the eight-month uprising against President Bashar al-Assad. 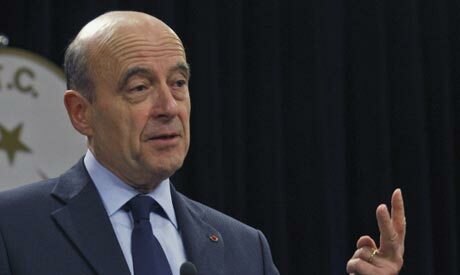 Foreign Minister Alain Juppe, who first floated the proposal for a humanitarian intervention on Wednesday, gave more details of the plan and said he would propose it to a meeting of Arab League foreign ministers gathering in Cairo to discuss Syria. After months in which the international community has seemed determined to avoid any direct entanglement in one of the core countries of the Middle East, the diplomatic consensus seems to be changing. The Arab League suspended Syria's membership two weeks ago, accusing Assad of failing to fulfil a Nov. 2 pledge to halt the violence and withdraw troops from cities. This week, the prime minister of regional heavyweight Turkey - a NATO member with the military wherewithal to mount a cross-border operation - compared Assad to Hitler, Mussolini and Gaddafi, and called on him to quit. Juppe said international monitors should be sent to protect civilians, with or without Assad's permission. He insisted the proposal fell short of a military intervention, but acknowledged that humanitarian convoys would need armed protection. "There are two possible ways: That the international community, Arab League and the United Nations can get the regime to allow these humanitarian corridors," he told French radio on Thursday. "But if that isn't the case we'd have to look at other solutions ... with international observers,"
Asked if humanitarian convoys would need military protection, he said: "Of course... by international observers, but there is no question of military intervention in Syria." He added that he had spoken to partners at the United Nations and U.S. Secretary of State Hilary Clinton, and would speak later on Thursday to the Arab League. On Wednesday Juppe also embraced the exiled opposition Syrian National Council as a legitimate group that France sought to work with. One Arab government representative at the League said measures which the 22-member organisation might consider on Thursday included imposing a travel ban on Syrian officials, freezing bank transfers or funds in Arab states related to Assad's government and stopping Arab projects in Syria. "There are many ideas and suggestions for sanctions that can be imposed on the Syrian regime," said the official, who asked not to be identified. The United States and the European Union have already imposed sanctions on senior Syrian officials, its oil sector and several state businesses. An EU official said on Wednesday the bloc was considering fresh financial sanctions. Washington repeated an appeal on Wednesday for U.S. citizens to leave Syria: "The U.S. Embassy continues to urge U.S. citizens in Syria to depart immediately while commercial transportation is available," the embassy said on its website. A Western diplomat in the region said about the U.S. aircraft carrier: "It is probably routine movement but it is going to put psychological pressure on the regime, and the Americans do not mind that". Syria's bloodshed could pitch the Muslim world into "the darkness of the Middle Ages", Turkish President Abdullah Gul said on Wednesday. A day earlier, Turkish Prime Minister Tayyip Erdogan criticised the "cowardice" of Assad, once a close ally, for turning guns on his own people. Erdogan spoke of the fate of defeated dictators from Adolf Hitler and Benito Mussolini to Muammar Gaddafi, who was lynched by a mob last month at the end of an uprising that ultimately won the support of the West and Arab League states. Khaled al-Habasi, an adviser to the Arab League's secretary-general, said the organisation was working on two tracks after it rejected amendments requested by Syria for a monitoring team to oversee implementation of a Nov. 2 peace deal. "They are working on uniting the Syrian opposition on a united vision regarding the future of Syria during the transitional period, and calling on the (Arab League's) social and economic council to impose economic sanctions on the Syrian government," he said. Speaking after a meeting with Syria's opposition National Council on Wednesday, Juppe described it as "the legitimate partner with which we want to work" -- the biggest international endorsement yet for the nascent opposition body. A spokesman for European Union foreign policy chief Catherine Ashton said the EU was ready to engage with the Syrian National Council and other opposition groups, but stressed the need for them to maintain a peaceful, non-sectarian approach. The violence in Syria itself showed no signs of abating. Authorities blame the bloodshed on armed groups, who they say have killed more than 1,100 members of the security forces since the unrest erupted in March. Syria has barred most independent media from Syria, making it difficult to verify accounts from activists and officials. Activists and resident said Syrian forces killed two villagers on Wednesday in an agricultural area that has served as a supply line for defectors. Two youths were also killed in the central city of Homs, 140-kms (90 miles) north of Damascus, which has become a centre of resistance against Assad. Activists said evening demonstrations were held in several neighbourhoods of Homs. In the south, two villagers were killed near the city of Deraa on the border with Jordan, where more tanks and armoured vehicles deployed in the last month after a slew of defections and attacks on loyalist forces, activists said. Also on Wednesday, state news agency SANA reported the funerals of nine soldiers and policemen killed by "armed terrorist groups". Thousands of soldiers have deserted the regular army since it started cracking down on the eight-month protest movement, inspired by Arab uprisings which toppled the leaders of Tunisia, Egypt and Libya. Assad, 46, seems prepared to fight it out, playing on fears of a sectarian war if Syria's complex ethno-sectarian mosaic shatters and relying on support of senior officials and the military. However many experts say Assad, who can depend mainly on the loyalty of two elite Alawite units, cannot maintain current military operations without cracks emerging in the armed forces.